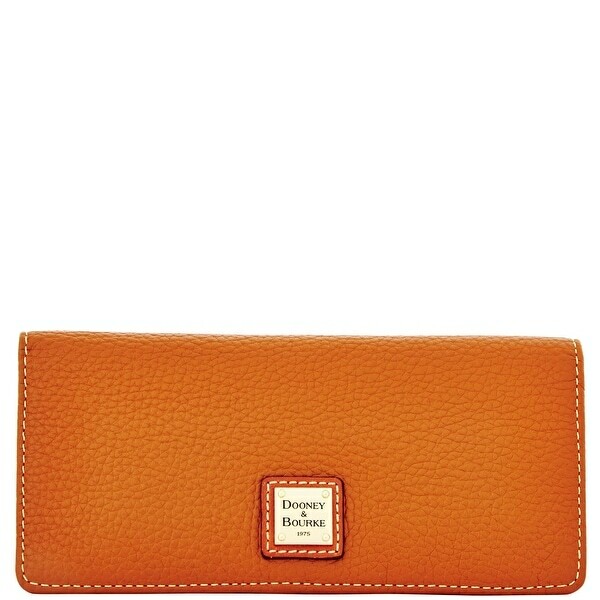 ILoveDooney offers you the best Dooney & Bourke handbags and accessories at prices easy to love. Through our partnership with Dooney & Bourke, all the products sold on ILoveDooney are 100% authentic and delivered in brand new condition in the original packaging. Additionally, any product sold by ILoveDooney is covered by Dooney & Bourke's ironclad one-year guarantee. Dooeny & Bourke stands behind the durability of its leather goods and offers an unconditional guarantee against any defects in craftsmanship for a full year of normal use. For customer service inquiries or to initiate a return, please contact ILoveDooney at service@ilovedooney.com or 1-800-827-0003. Pebble textured leather and a gold-plated logo add instant style to this compact wallet. The interior pocket system provides organized storage space and the zippered pocket keeps coins secure. H 3.75" x W .75" x L 7.75" One outside zip pocket. Three inside slip pockets. Twelve credit card slots. License window. Snap closure. I love this product. It is very nice and didn’t cost me as much as anywhere else that I could find it. Very thankful and happy with my product. Beautiful wallet. Very well worth the price. Would highly recommend. Perfect size and plenty of room for cards. Bought the D & B white/camel small Audrey bag to match for Summer. Matched the purse, perfectly. Love it!